One of the ways I'm working to change my operating system is my food - and my relationship with it. I will explain more about that Monday, but suffice it to say, I've been rediscovering several once-loved things that had fallen by the wayside. One such thing? Cooking. Delicious, flavorful, cooking. One of my favorite flavors? Rosemary. And what's better than a little (ok, a lot) of rosemary and chicken? 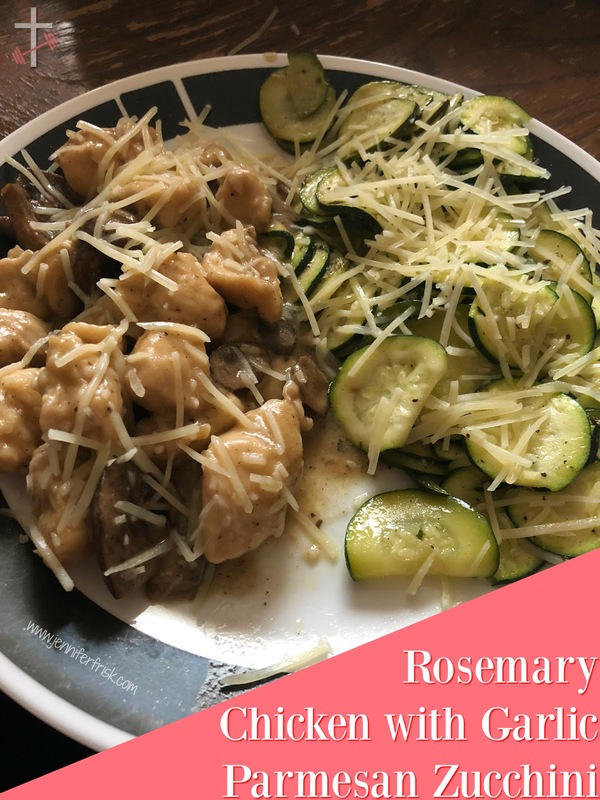 Rosemary, chicken, and delicious garlic Parmesan zucchini rounds. Preheat oven to 475°F. Toss together zucchini, 2 Tbsp oil, garlic, thyme, ½ tsp salt, and ½ tsp pepper on a rimmed baking sheet. Bake zucchini 10 to 12 minutes or until browned and tender. While zucchini is baking, add flour and ½ tsp each salt and pepper to a gallon ziplock bag. Shake well. Add chicken pieces, and shake until all chicken pieces are covered. Cook chicken in remaining oil in a large nonstick skillet over medium-high heat 3 to 4 minutes per side. Remove from skillet. Cook mushrooms in skillet over medium-high heat until browned. Stir in broth, rosemary, and ¼ tsp each salt and pepper; return chicken to skillet. Bring to a boil, reduce heat, and simmer until liquid is reduced and chicken is done. Whisk in mustard and butter until melted. When zucchini is done baking, stir and sprinkle with cheese. Bake 1 to 2 minutes longer or until cheese is melted. Easy, quick, and tasty! Please let me know below if you give it a try! how man 21 day fix servings is this?